This exhibition of steel and ceramic sculpture is Tim Scott’s first London show since 1979 at Kasmin gallery. Scott has been a major influence in British and European sculpture since the 1960’s, and alongside sculptors such as David Annersley, Michael Bolus, Philip King, and William Tucker, he became a part of a group of young sculptors dubbed the ‘New Generation’, for an exhibition at the Whitechapel Art Gallery in 1965. In 1964, just prior to the Whitechapel show, the critic Clement Greenberg proclaimed that they were “doing the best sculpture in the world today”. Scott initially came to London to study architecture, but was simultaneously studying sculpture under Anthony Caro at St. Martin’s School of Art. Scott’s student work was naturally heavily influenced by Caro who, at that time, was still working in a traditional style. When Scott moved to Paris to work at the Atelier Le Corbusier-Wogenscky, an architectural practise, he discovered illustrations of the work of the American sculptor David Smith. Caro had met Smith during an influential trip to America in 1959 which radically altered the way he, Caro, worked. Caro and Scott discussed the work of Smith when Caro visited Scott in Paris. This was a crucial turning point, not just for Tim Scott, but for the vanguard of British sculpture in the Sixties. Returning to London in 1961, and encouraged by Caro, Scott and other students at St Martin's School of Art rejected traditional methods and began to work abstractly. Whilst Caro and a few other students began using heavy industrial steel, Scott opted instead to use fibre-glass, a relatively new material for sculpture. By the mid-Sixties Scott was experimenting with different kinds of plastics and bold volumetric shapes with intense colour, as in Quadreme 1966 and, by 1969, the Bird in Arras series, in which large sheets of acrylic were mounted onto a steel framework. By the end of the Sixties Scott had become increasingly frustrated by the fragility of plastics and the inability to place work outside. In response, he made Cathedral 1970/71, a huge walk-through outdoor sculpture made entirely of steel. Whilst making Cathedral Scott met his village blacksmith in Yorkshire who introduced him to the methods of forging steel that would become an important part of Scott's sculptural repertoire. By 1975, with the Nataraja series, plastic was completely abandoned and the steel allowed its full freedom to develop. These first all-steel sculptures used manufactured plate and bar that was welded and bolted together. Whilst occasionally a steel element might have a simple bend imposed, more often than not the bar or plate was simply cut and welded into place. This method relies on ‘found’ steel, having a stockpile of pieces of varying gauges, thickness, cross section and shape. 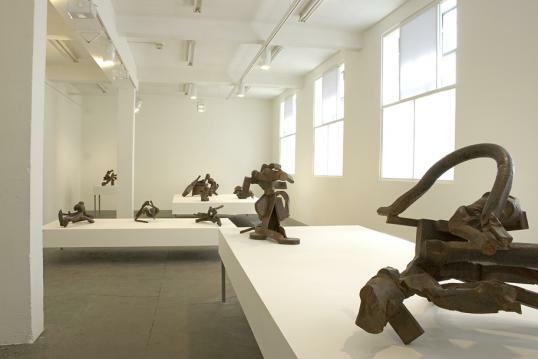 Although still relying heavily on manufactured plate and bar, the Mudra series in 1975 introduced elements of steel that had been bent and manipulated to play a specific part in the sculpture. From then on Scott was working at a tremendous pace with the Rupavali, Shruti, Kubikos and Uttica series all made in 1976/7. Steel allowed Scott to work fast, cutting, welding together, then cutting again to adjust relationships and finalise positions. The forged steel sculptures in the present show continue to expand upon the methods Scott pioneered for himself in the Seventies, but they are more complex than any previous work, both in their construction and the ambition for their sculptural content. Scott's dissatisfaction with more planar and pictorial modes of abstract sculptural construction and his desire for physical movement through the material, is more fully developed in this work. Forging, where the metal is heated to almost white-hot and then shaped with hand- or power-hammers, is the principle means by which Scott now expresses his three-dimensional forms. The bulk of the material appears to be pushed and pulled into service with both ease and simplicity, despite the forces involved in their production. Expressed as simple twists, and subtle changes in direction and cross-section, the metal is worked so that the tool marks add to the movement and flow of each element. These discreet parts have a spareness and often an elegance in themselves, yet they always become part of a complex physical movement which informs the whole piece. Scott has introduced significantly contrasting elements into these works. Hard-edged industrial offcuts are welded into position to complement and reinforce the complex formations of beaten metal. For example, Swing and Bow 1 1992 has within it two parallel but contrasting sculptural elements. The lower and longer one, which is forged from several pieces of joined steel, plays a structural part in lifting the sculpture off the ground. Contrastingly, the upper element is a single straight bar, shorter and square-sectioned, reinforcing the direction and intent of the lower piece. This kind of inclusion of orthogonal elements to counterpoint more manipulated and modelled parts recalls previous work such as Gamboge 1961, which has an organic hub enclosed by a hard architectonic enclosure. Despite the solidity and mass of the material, Scott creates movement, space and lightness in these works, which often appear to defy gravity. With a firm grip on the plinth, these sculptures then reach out into space with expression and dynamism. Huge weights are suspended effortlessly in space, as in Swing and Bow 1, where an overarching bar is bent under the pressure of the hanging forms. Steel is probably exclusive in its ability to allow the sculptor to extend out into space to this degree, creating an openness impossible for other materials. The spaces themselves have been created by the construction and positioning of the components, rather than by cutting or carving into the material. Scott takes advantage of this, and creates an emotionally charged dialogue between the elements and the spaces linking the nearly touching parts. The buoyancy of these sculptures helps create a real sense of movement. One Step Dance III 1992, as suggested by the title, gyrates in space, sinuously twisting to such an extent that the steel doubles back on itself. The tension is generated by the use of geometric elements to complete the movement of the forged metal pulling around itself. Scott makes the metal work to the limits of its capabilities, and to an exact specification. These are rigorous and brisk sculptures with surprising contradictions and a wrought, raw and poised energy.